Don’t Forget To JOIN Associations | Find meaning at work and advance in your career. In general, there are two types of organizations association employees can join: industry associations such as ASAE or associations focused on a specific functional area – for example, the American Marketing Association for someone who works in marketing. 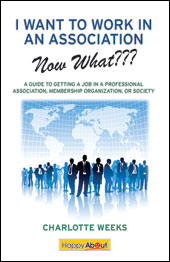 There are three main ways joining associations can make an impact on your career. 1) Education: You’ll likely get a break on teleseminars, certification courses, etc., in addition to tons of free information through newsletters, blogs, e-lists, and members-only meetings. Even if you only have time to utilize one of these methods, you’ll stay on top of industry trends. 3) Networking: Associations provide ample opportunities for meeting others in your industry. Even if you’re not actively searching for a job at this time, you’ll be prepared in the event the decision is made for you (or on the other hand, considered for opportunities you didn’t even know existed!). Not sure which association is a fit for you? Ask industry colleagues, Google relevant associations in your area (i.e. finance associations + Boston), or visit Weddles.com for a comprehensive list of organizations grouped by industry. This entry was posted in Association Career, Career Management, Education, Job Opportunities, Job Search, Networking and tagged American Society of Association Executives, association industry, Associations, Career, continuing education, credibility, industry associations, professional associations, professional networking, Trade association. Bookmark the permalink.